Caroline Atwell (born Oct. 2, 1835) told her oldest daughter Emma Viola Noyes Harmon many interesting things of her life in Vermont. Her mother was Rachel Scagel and was apparently brought up above ordinary rank. An old copy of Goldsmith’s “Vicar of Wakefield” is still in Mrs. Harmon’s possession and it belonged to Rachel Scagel in the days when books were scarce. (Note: This book “Vicar of Wakefield” is in the possession of Pansy Noyes Bryant, great granddaughter of Rachel Scagel, at the present time, 1960). Caroline Atwell always wore wool clothing in her younger days–petticoats, aprons, dresses, underwear, and even stockings were spun at home. She always believed wool was conducive to health. Note: (by granddaughter Pansy Noyes Bryant) So strong was her opinion about wool that my father insisted his first baby’s dress and petticoats were pure wool and I have in my possession a wool blanket in which all my grandmother’s children, my father’s children and my first child was wrapped in birth. She was a believer in many of the health fads of the day. Always took a daily cold bath even tho she had to break the ice to do so. She took long walks and encouraged her children to do so. Caroline was raised in the days of hoop skirts, corsets, etc., but she was a believer in sensible clothing for women and refused to wear corsets all her life. Vermonters were famous for their apple butter and her mother was one of the best at this art. Much of it was sold in Boston–days being consumed in this journey of taking produce to market and then bringing back goods for the family. 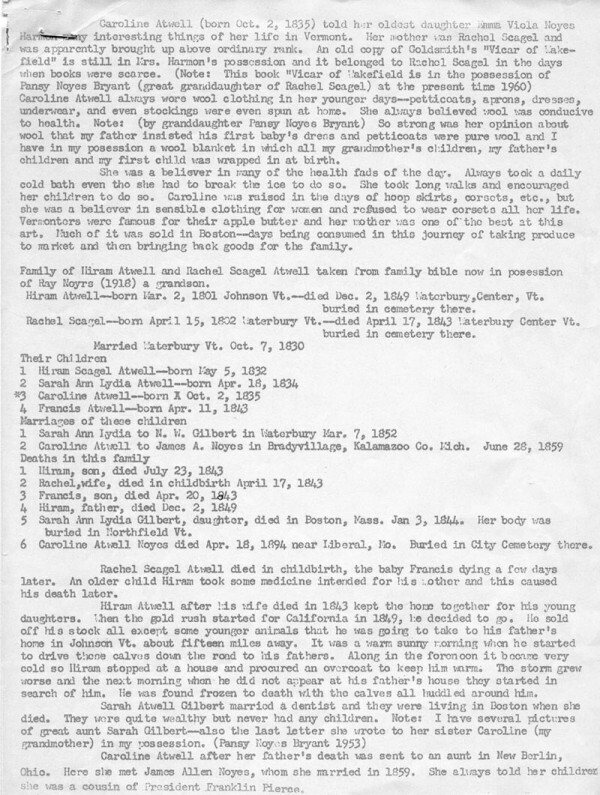 Family of Hiram Atwell and Rachel Sacgel Atwell taken from family bible now in possession of Ray Noyrs (1918) a grandson. Hiram Atwell–born Mar. 2, 1801 Johnson Vt.–died Dec. 2, 1849 Waterbury, Center, Vt. buried in cemetery there. Rachel Scagel–born April 15, 1802 Waterbury Vt.–died April 17, 1843 Waterbury Center Vt. buried in cemetery there. 5 Sarah Ann Lydia Gilbert, daughter, died in Boston, Mass. Jan 3, 1844 [should be 1877] . 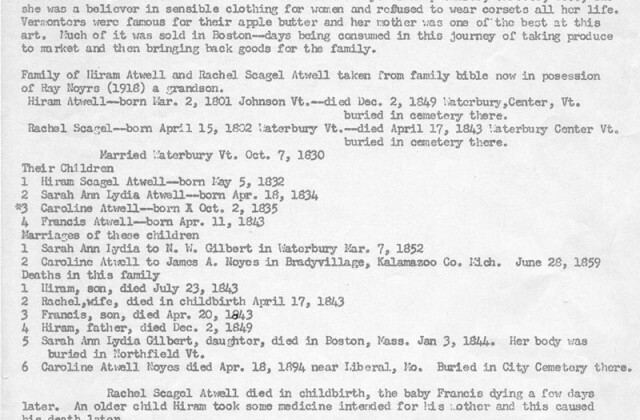 Her body was buried in Northfield Vt.
6 Caroline Atwell Noyes died Apr. 18, 1894 near Liberal, Mo. Buried in City Cemetery there. Rachel Scagel Atwell died in childbirth, the baby Francis dying a few days later. An older child Hiram took some medicine intended for his mother and this caused his death later. Hiram Atwell after his wife died in 1843 kept the home together for his young daughters. When the gold rush started for California in 1849, he decided to go. He sold off his stock all except some younger animals that he was going to take to his father’s home in Johnson Vt. about fifteen miles away. It was a warm sunny morning when he started to drive those calves down the road to his fathers. Along in the forenoon it became very cold so Hiram stopped at a house and procured an overcoat to keep him warm. The storm grew worse and the next morning when he did not appear at his father’s house they started in search of him. He was found frozen to death with the calves all huddled around him. Caroline Atwell after her father’s death was sent to an aunt in New Berlin, Ohio. Here she met James Allen Noyes, whom she married in 1859. She always told her children she was a cousin of President Franklin Pierce.